Once a very popular piece, Liezi Yu Feng has undergone various revisions but is still recognizable in the 40 handbooks through 1876 which include it,6 as well as in the 1950s recording of Le Ying7 playing it "from handcopied qin tablature", now available on CD. as for this piece, Mao Zhongweng wrote it based on the account in the Yellow Emperor chapter of Liezi, in which (Liezi) rides the wind in such a way that his spirit roams throughout the universe.9 The flavor of the tune is the same as this story. (01.04) 03. How vast is the universe! ZWDCD has only 1921.2 列子 the book; 10392.75 御風 quotes Zhuangzi Section 1: 列子御風而行. Nothing about a melody. For more information on jiao mode see Shenpin Jiao Yi. See also Modality in Early Ming Qin Tablature. This image from an anonymous painting was probably not specifically intended to depict Liezi, but it suits the concept of his riding the wind. 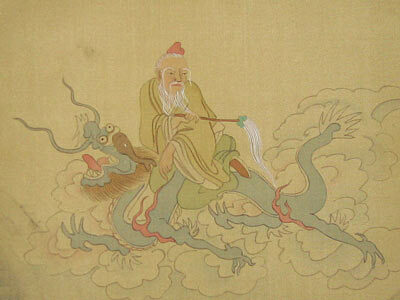 Compare the image with the one for the prelude, Lingxu Yin, as well as the image of Qu Yuan with Li Sao, which also involve being seated on an animal or chariot, and note that although he is on a cloud, there does not seem to be a comparable expression "ride the clouds", or even for humans "flying". Other online translations include that of Burton Watson (search for "Lieh Tzu7 could ride the wind and go soaring"). Liezi had Old Shang as a teacher, and Bogaozi as his friend. When he had nothing more to learn from either of them, he came home riding the wind. Yin Sheng heard of him, joined his disciples, and for several months did not look for lodgings. Ten times, when Liezi was not busy, he took the opportunity to beg for his secrests; and each time Liezi turned him away and would not tell him. Yin Sheng was indignant and took his leave; Liezi made no objections. A few months after Yin Sheng withdrew he had not renounced his aim, and went to join Liezi again. 'Why do you keep coming and going?' Liezi asked him. 'I used to thik you intelligent; are you really as vulgar as all that? Here, I will tell you what I learned from my own Master. Three years after I began to serve the Master and befriend a certain man, my mind no longer dared to think of right and wrong, my mouth no longer dared to speak of benefit and harm, and it was only then that I got as much as a glance from the Master. After five years, my mind was again thinking of right and wrong, my mouth was again speaking of benefit and harm, and for the first time the Master's face relaxed in a smile. After seven years, I thought of whatever came into my mind without any longer distinguishing between right and wrong, said whatever came into my mouth without any longer distinguishing between benefit and harm; and for the first time the Master pulled me over to sit with him on the same mat. After nine years, I thought without restraint of whatever came into my mind and said without restraint whatever came into my mouth without knowing whether the right and wrong, benefit and harm, were mine or another's, without knowing that the Master was my teacher and the man I have mentioned was my friend. Only then, when I had come to the end of everything inside me and outside me, my eyes became like my ears, my ears like my nose, my nose like my mouth; everything was the same. My mind concentrated and my body relaxed, bones and flesh fused completely, I did not notice what my body leaned against and my feet trod, I drifted with the wind East or West, like a leaf from a treee or a dry husk, and never knew whether it was the wind that rode me or I that rode the wind. Yin Sheng was deeply ashamed, held his breath for a long time, and did not dare to speak again. A number of other translations can also be found online. Zha Guide 5/56/80: the 40 handbooks through 1876 also include the variant titles 御風行 Yu Feng Xing (1585) and 列子 Liezi (1596). There is also an old story here mentioning a melody called 御風曲 Yu Feng Qu. Also known as "Yue Ying". 9. "Riding the wind in such a way that the spirit roams throughout the universe"
"御風擬神遊六合"; 擬 is "determine, resemble, compare"; "神遊六合" is also the name of another qin melody, Shen You Liu He . The lyrics from the version in 1585 can be sung here, suggesting the whole of Liezi Yufeng in the original edition of Zheyin Shizi Qinpu had the same tablature as here. See also the original Chinese section titles. (1573; #46) Same as 1585?